Carle’s art translates into 3D computerized imagery quite well. 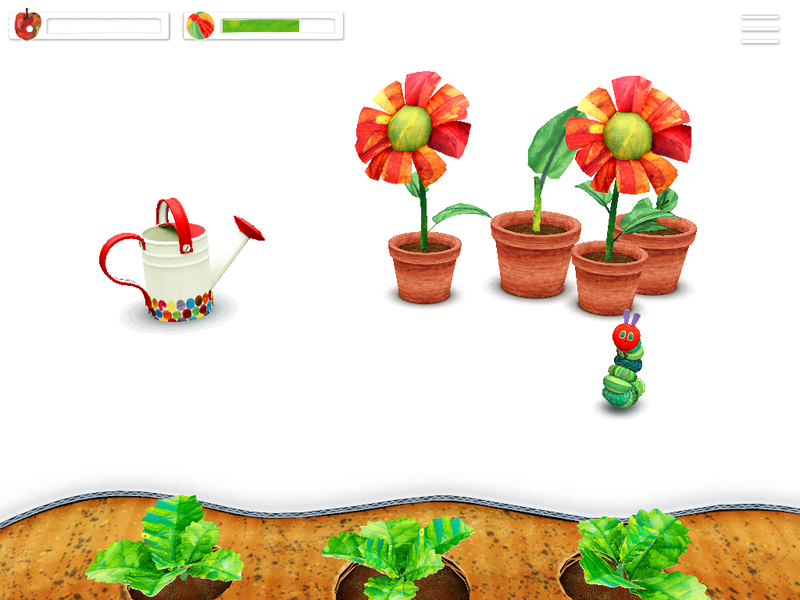 Trees, fruit, flower pots, and toys are rendered against a background of white space that makes it easy to focus on the open-ended gameplay. There isn’t any directly educational content, e.g., 1-2-3s and shapes and sorting, but the objectives require fine motor and critical thinking skills that would challenge 2 year olds and be just right up until about kindergarten (every child is unique/your mileage may vary). Every in-game day, you are in charge of feeding the caterpillar an increasing amount of fruits and playing with it until both health bars (one for feeding, one for playtime) are full. The concept of a video game health bar will be familiar to older children, but little ones may need a bit of instruction. When both bars are full, you can put the caterpillar to bed, where it will sleep for a few seconds and then wake up for another day with its health bars empty again. After a few days have passed, the caterpillar will form a chrysalis and change into a magnificent butterfly – then you start again with a new caterpillar. One of the active play scenes involves putting the caterpillar on a little boat and floating around with some rubber ducks. I found the boat very difficult to control and it was almost impossible to land it on the shore and then get the caterpillar to jump off – it’s unclear whether this is user error (hey, I’m not perfect) or just bad design, but it looks to me like a stopping point for child players. Maggie Kutsunis is a children’s librarian in the Chicago suburbs. She blogs at storytimewithmaggie.wordpress.com and tweets @maggiekuts. She also reblogs feminist rants, jokes about art history, and gifsets from Disney films at mbwk.tumblr.com. Posted on November 3, 2014, in Apps and tagged Maggie Kutsunis. Bookmark the permalink. Leave a comment.